How about layers of colours and texture to celebrate Spring. Did you remember today is officially Spring? I hope you did because in my family, things like this would never be missed! How could we? There were so many calendars at home, between le calendrier de la poste (the Post Office Calendar), le calendrier des pompiers (the Firemen Calendar) or le calendrier du club de foot (the Football Club Calendar). I don’t know whether this is a French tradition or what, but let me tell you, where I am coming from, I don’t know many French family households who do not end up, every year, with less than 2 calendars at least. «-Bonjour, c’est pour le calendrier de la poste. -Mamaaaaannnnn, c’est pour le calendrier de la poste! You end up with so many that you have no excuses to miss special days, such as March 21st, Spring Day! I find it strange and funny to think how I came up with the idea for the dish that follows. I could think it has to do with the great seared tuna recipes I had seen on both Stephen‘s or Tami‘s superb blogs. Maybe. Or from Fred’s as it turns out that her most recent post presents a great seared tuna as well, le steak de la mer (the ocean steak) as she puts it. It could be those, or it could not be those. Still following me? It was not! BUT it could have been. And why is that? Because I had planned to make this tuna dish weeks before, but was never able to due to a lack of my baby in the kitchen pantry, my pink peppercorns! So now that this major malheur (misfortune) had been solved, I was a happy girl and could fulfill my tuna dream. Pink rosé for the fish, fushia for the beetroot and pink for the seeds. And what about a few words about the pink peppercorns. Let’s put things straight. In view of comments left by my dear readers, some expectations rose high as to what I was going to make with those lovely seeds. Here is the truth: this recipe is NOT the one for which I used my peppercorns first. I cheated and decided to present the tuna recipe first before the other mysterious one, just because I thought it was a more appropriate recipe for Spring Day. Of course, I was the only one to choose, so my life was easy. Let’s just say you will get recipe #2 very soon. How about stretching the wait. I truly hope not to disappoint anyone – and now I better not!-, such as Anita or Fabienne who seemed to be waiting for something sweet, soft, delicate, such as a to-die-for dessert! Sorry sorry! But my internal clock asked for savoury (besides, don’t you think I presented too many desserts these days?) I however truly look forward to trying the seeds in sweet preparations. As a matter of fact, I have an idea. What about asking Rob? He surely would have great ideas for this kind of chemistry since he is so magnificently experimental with alternative flavors in his kitchen laboratory! Let’s ask him what he thinks! Take a mortar and crush all the spices seeds together (except for the fleur de sel). Cook one zucchini cut in pieces in boiling water for 10 mns or so. Mix it well with a hand processor (30 s is enough). Chop in small cubes the other zucchini. Add salt and pepper, the mixed zucchini, and the fresh chopped coriander. Add 1 tbsp of olive oil and set aside. Take your tuna steaks and press gently the bottom and face in the crushed seeds. Take a large frying pan and heat one tbsp olive oil. Sear on each side for about 30 s or less. Make sure the tuna flesh stays rosé. Mix together the balsamic vinegar with the hazelnut oil. Mix with the beetroot and set aside. Take a plate and in the middle, place a small portion of the zucchinis (the size of your tuna steaks) in the middle. 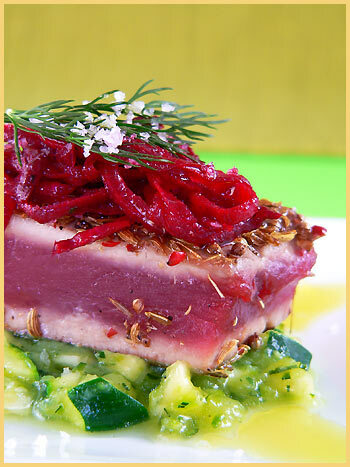 Place the tuna steak on top and finish with some grated beetroot salad. Sprinkle with fleur de sel and a few dill sprigs. Sprinkle over a few more drops of olive oil and serve without waiting, with a dash of lemon juice if you like. This is a great appetizer. *Fleur de sel (Flower of salt) is a hand-harvested sea salt, very delicate in flavour. It is collected from the top layer of salt before it sinks to the bottom of large salt pans (Wikipidea reference). I find it a great addition for meals and use it very often. It should not be cooked but added at the end, once the food is cooked. IMPORTANT SPRING NOTE: I had a second thought. Is Spring today or was it yesterday? I am confused. I need one of those calendars!!!! It is a pity that the firemen don’t come to sell calendars at my door here! Where are they? Bea, your blog is simply beautiful. The photos are particularly refreshing!! Love it! The first thing I learned is that there is a difference between pink pepper and pink peppercorns. The former, also known as poivre rose, according to McGee, is “made by preserving just-ripened red berries in brine and vinegar.” Pink peppercorns, on the other hand, are the fruit of the Brazilian pepper tree (aka Schinus terebinthifolius), which is now considered an invasive pest in the southern US! Is it safe to assume you’re cooking with pink peppercorns, not pink pepper? What a gorgeous feast of Spring colours Béa! What a treat !! Bea that’s so beautiful !! (I’ve added a PS to my note so you won’t have to struggle with the trackback anymore). Ah, le calendrier de la poste… S’il me permettait d’aboutir à des recettes comme ça je le regarderais plus souvent ! The cooking is perfect ! pour le moment je n’arrive pas à lire ton post je suis juste scoochée aux photos, je reviens après déjeuner. I’m totally impressed by you emphasizing to use hand-harvest sea salt! How true! I believe that “crunch” just bring out the soul of this dish! Btw, there are 5 different types of salt in my pantry. Very stunning foto! Very spring! Lovely colours Bea, the tuna looks cooked to perfection. YOu can have my pommpier one!! They got me while I was gardening this January– you cant run away from two cute french firemen!! I put it in the tiroir with all the others! We are in sync- I came here today to look at some of your fish recipes, I got some fresh “loup de la mer” and wanted some inpiration from you and I got it!! fruhling.. why am speaking german here… because its one of the first german word i knew spring…. calendar? when I was in france last october, les calendiers kept coming in you know….by the time i left we had 3 and it was only october. How about a calandar with your gorgeous photographs of food? That’s something I’d happily have hanging in my kitchen! Beautiful, my dear, as always. I don’t even like fish or beets but it’s making me hungry! Ah Rob, Excellent. I knew I had knocked at the right door! Thanks so much, SO! What are YOU going to make with them? I used pink peppercorns yes. 😉 Thank God for my hubbie! Bron, thank you! Spring here, autumn for you ! Fred, thanks a bunch! I think your tuna steak was so zen and refreshing! I will def try it too. Liza, tu es drôle! 😉 Alors toi aussi tu es victime de ces fameux calendriers, je le savais! Anne, j’espère que cela ne colle pas trop! Et ton déjeuner, c’était bon? Gattina, yes it is true, isn’t it? Such a beautiful addition. I am like you, I have a lot of different salts. What are yours?? Stephen, thanks, yours is great! Riana, un calendrier des pompiers, toi aussi! Ah ah! La pauvre. Miam, loup de mer, j’adore cela! Fabienne, yes yes, we need those summer vegetables. I know I am crazy but I called around to get red currants and they told me June only! I knew that but tried anyway. Tea, you are funny, but guess what, you are giving me an idea. Want to be my business manager? Bea, that is just DEE-LISH! I love tuna rare but also seared like that is just as tasty. Beautiful plate job! 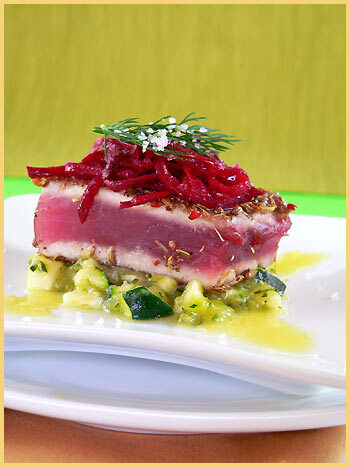 I love beet root and I love tuna, combining them with coriander and pepper probably gives that tuna the rich flavor it deserves! Incredible! I have two types (fine and coarse) of sun-drenched sea salt from California; plus one called Kosher salt (chemical free), I used them for cooking. I use iodized coarse salt in sprinkling on the top of bread/ its dough; then also have simple table salt and sea salt from Korea. Saw pink salt on TV, want to try if I see it at store. Would like to see yours if you have a chance 🙂 Yup, I believe textures of salt make the food’s flavor different. Thanks Rowena, nice to read you again! Forgintorrie, thanks for your sweet note. Yes I am like you, love beets and tuna very much too! You make me curious about pink salt now too. What did they use it for? The pink salt I mentioned is from California, but heard Australia also produces it. It’s not very much about the flavor but its texture… it’s flake-like and best for finishing a dish, esp fish. Its pink color certainly is very pleasing too. tes photos sont vraiment à tomber par terre! celle-ci est magnifique, j’ai super faim! Thanks for the shout-out 🙂 Your dish looks incredible!! i llove courgettes!!!!!!!! plz send me a free sample!!!!!! !